Healthcare supplies include the medical equipment and devices which are supplied to various medical centres, medical institutions, and hospitals for their daily operation. The demand for these supplies is estimated to increase with increasing healthcare infrastructure along with increasing incidences and awareness of diseases. Technical innovations by leading market players in the global hospital supplies market are introducing advanced products to help medical professionals to treat their patients more efficiently. Demand for different types of healthcare supplies is estimated to witness a steady growth during the forecast period. Increasing awareness towards control of hospital acquired infections (HAIs) as well as increasing need for detection of diseases for better treatment is also a major driver for the hospital supplies market. However, the regulations imposed by the government and home healthcare may restrain market for healthcare supplies. This report identifies the global healthcare supplies market size in for the year 2014-2016, and forecast of the same for year 2021. 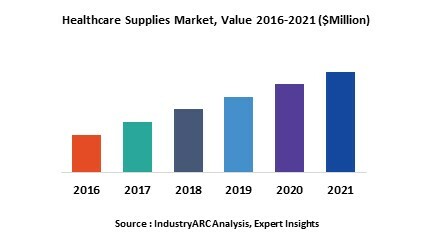 It also highlights the potential growth opportunities in the coming years, while also reviewing the market drivers, restraints, growth indicators, challenges, market dynamics, competitive landscape, and other key aspects with respect to global healthcare supplies market. Geographically North America dominated global healthcare supplies market owing to aging population and increasing prevalence for lifestyle diseases such as cardiovascular diseases, diabetes, hypertension, and obesity in the region. Asia-Pacific is projected to have fastest growth, owing to steady progress health care reforms, existing demand supply gap and high population levels in emerging economies coupled with rising income. Emerging markets hold a huge potential for growth of healthcare supplies market. 9.2. Advanced Sterilization Products Services Inc.